Figure 1 Application’s perspective illustrations OPSS‘s architecture from application point of view. Such architecture allows OPSS to support different security and identity systems without changing the APIs. OPSS is integrated with Oracle Fusion Middleware‘s management tools to administrate and monitor the security policies implemented in the underlying identity management infrastructure. Therefore, OFM technologies such as Oracle SOA, Oracle WebCenter Suite, Oracle Application Development Framework (ADF), Oracle Web Services Manager (OWSM) and… could use OPSS capacities. OPSS offers abstraction layer APIs those isolate developers from security and identity management implementation details. In this way, developer can invoke the services provided by OPSS directly from the development environment (e.g. JDeveloper) using wizards. Admin can configure the services of OPSS into the WLS. 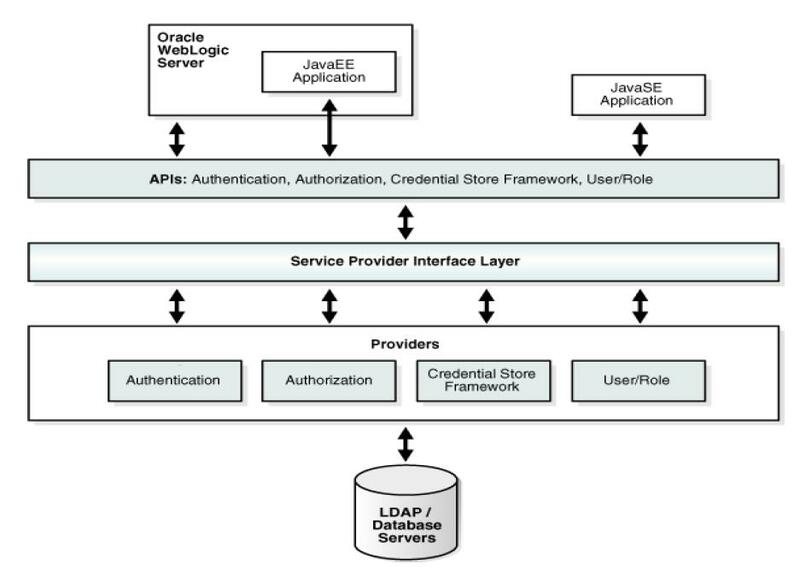 As you see in Figure, the uppermost layer consists of Oracle WebLogic Server and the components and Java applications running on the server; below this is the API layer consisting of Authentication, Authorization, CSF (Credential Store Framework), and User and Role APIs, followed by the Service Provider Interface (SPI) layer and the service providers for authentication, authorization, and others. The final and bottom layer consists of repositories including LDAP and database servers. Figure 2 OFM-Component’s perspective shows the various security components as layers. The top layer includes the OPSS security services; the next layer includes the service providers, and the bottom layer includes the OPSS security store with a repository of one of three kinds. OPSS provides auditing capabilities for components too. 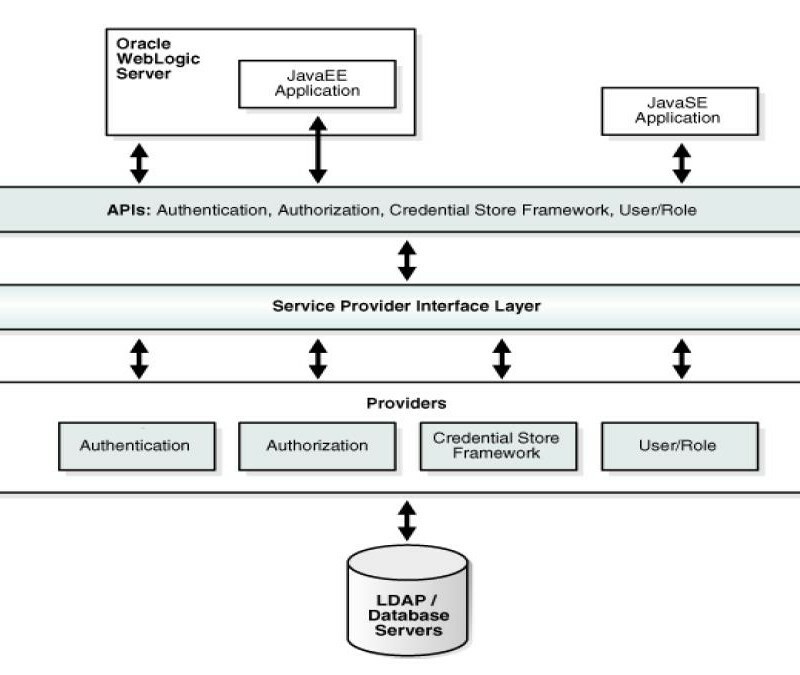 The second layer [Security Services Provider Interface (SSPI)] has the capability that works with Java EE container security – named Java Authorization Contract for Containers (JACC) mode and in resource-based (non-JACC) mode, and resource-based authorization for the environment. SSPI is a set of APIs for implementing pluggable security providers. A module implementing any of these interfaces can be plugged into SSPI to provide a particular type of security service. Therefore, OPSS has a consistent structure and is able to meet the requirements for integrating JEE Applications generally and specially OFM-Components and Oracle Security technologies, such as OAM, OID and so on.